Don't know what knowledge you have of the Evans. The seated woman was called Grandma Evans by my mother. This is the family my grandmother lived with after she left her father's home in Welaka. 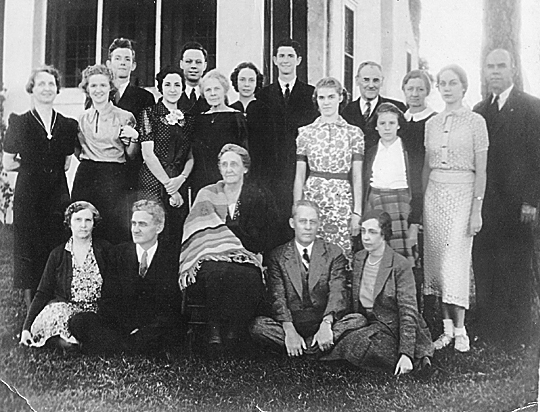 The others on the front row were Mrs. Evans children. Left to right Julia, son?, Mrs. Evans, M. Hussan ? and Mary Elisabeth Evans-Hussan. Not sure of the spelling. her husband, Thomas Davis Evans, died in Federal Point in 1910. Only 2, 3, 11 are still alive. 2 (my grandmother) and 3 live in CA. 11 lives in FL.